#Wheresmy350mBoris – the lie that suggests Remainer desperation? Regular Goldblog readers will know that I believe that, like with ad hominem attacks, when you have to lie it is because you have lost the argument. It is worse when you are a politician or a public figure, in which case your lie becomes more serious, particularly when using it to call for someone to be jailed. It devalues debate and is even more disappointing when you are in full knowledge that what you are saying is a lie. In the determined ‘exit from Brexit’ campaign currently being led by James Chapman, now a PR executive but formerly the chief of staff to Brexit Secretary David Davis, Chapman is using the same lie as other Remainers use….namely that the £350m to the NHS claim must be a lie itself as it hasn’t appeared yet. I have written before about this central part of the Leave campaign. In a detailed article (click here) I explained that the 350m isn’t a lie as it is the only figure that HAS to be paid as it is in the Treaty arrangements, whilst the rebate is voted on every 7 years as part of the budget arrangements (and the UK has often had to concede on issues to regain it), and the money that comes back as subsidies and grants are at the whims of an EU bureaucrat (subject to corporate lobbying and EU pet projects) rather than the UK Government, who are likely to possess better information on where it is most needed. Furthermore, it is a defendable claim that the ‘let’s spend it on the NHS’ is an illustration, not a commitment. In simple terms, there is not a chance for any legal case on this issue. But that’s not the point of what I am saying. What I am fed up of is the amount of knowledgeable people claiming that the ‘350m to the NHS’ must have been a lie because it hasn’t appeared yet. 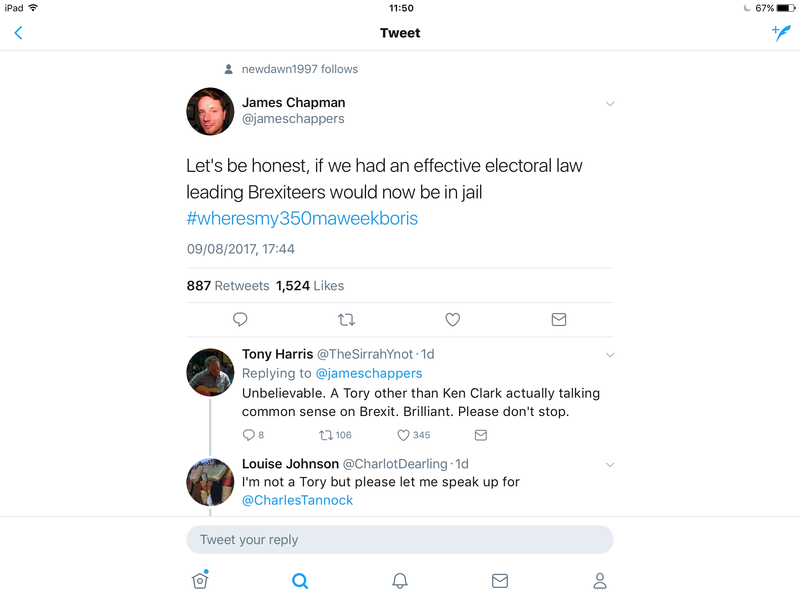 A Prominebt Remainer did it when he came to talk at my school, and James Chapman is the latest. See his tweet at the top of this blog. He actually has the temerity to start this tweet with ‘Let’s be honest’, before calling for the jailing of leading Brexiters. His hashtag is the problem. It is a lie. It is a lie because James Chapman knows, as does the Prominent Remainers mentioned earlier and numerous others before them, that the £350m is an amount that is not available until we stop paying it into the EU budget. The earliest this can happen is at the end of the Article 50 process, which is scheduled to be March 2019. Even then of course as part of the transitional deal we will still have to pay some money towards the budget for a few years. But ignore that complication, the fact is that it was extremely clear what the Brexiters were talking about…that we currently pay an amount of money into the budget and eventually we won’t be, and we can use that money for what peter we want. In the future. Not now. I am sure the likes of Chapman may well defend their lie by saying ‘well the Leave campaign lied, so why can’t I?’ To which my answer would be that they are attempting something very difficult, which is to overturn a referendum decision, and to achieve that they need to retain their integrity. The fact that they aren’t smacks of desperation, and I think it is beneath them. There are plenty of valid arguments that can be used to persuade the British public and Government there should a chance to think again, but the use of lies isn’t one of them. Wholeheartedly agree with your last paragraph whilst disagreeing with your third. Is that allowed? Even with your detailed supporting blog, I am unconvinced that the £350m is not a lie, especially combined it with the words ‘send’, nether mind the NHS nonsense. Your argument – that it’s not a lie because it’s the only definite figure – certainly wouldn’t work if I was a builder submitting my income to the HMRC, or in just about any other discussion. Your underlying argument, that claims for the outcomes of Brexit on the economy shouldn’t be made until it’s happened, is very sound. But that’s being undermined by both sides, and the reality won’t be known until it’s too late. First of all Alistair, you are allowed to agree or disagree with anything you want! The 350m, the point I make, is a defendable lie. We DO have to send that money and there is an amount of money we could spend on our priorities if we weren’t sending it to the EU. Of course, it ignores the money we get back and more importantly the amount of money in total we make from the benefits of being in the EU, but in a campaign it was the Remain campaign’s job to make that clear. Instead, they went on and on about it being a lie. Thus bringing everyone’s attention to the figure. That’s great to know that we can bank the £350 million – that seems to be a fact – another fact is that each year having completed my Tax Return I contribute 1.1% of my total taxes to the EU – for that I have access to the EU and its Labour markets – so the 1.1% will go towards the 20% of my taxes that support the NHS – so post 2019 my contribution to the NHS will be 18.9% – these are all facts because the HMRC confirm it each year on your Self Assessment Tax Return . Its also a fact ( Tim Halford on Radio 4) that of 100 working people in the UK 50 pay no direct Tax/ 40 pay only 20% / 9 pay 40% and 1 pays 45% – and within that fact is the biggest challenge – how do you increase the number of people paying more direct Tax post 2019 ! Bottom line is that whether we leave the EU or stay life would be fine if we are confident that we have the intellectual capacity at Government level to manage UK plc – now I suggest that would be an interesting Blog ! On your second point, when I do talks on the book ( happy to do one at your place of work by the way!) people ask me what I think of Brexit, and I answer that it is just too early to tell. At the moment there is a huge amount of confirmation bias going on, with people using only statistics that confirm their view to make their points, but Daniel Hannan says that in 2050 with new trade deals and sovereignty for 25 year we will know more about why it was a good idea! Yes, well you are right about the need to increase the tax base. At some point the likes of Jeremy Corbyn may have to come clean with his electorate on that! I also believe there will be many opportunities to get better people into government work over the next few years as there will be so much to be done. I think I am training the next generation of civil servants to help deliver Brexit successfully, which is an important responsibility. Keep issuing the Blogs – they are very stimulating ! Hi Keith. Apart from chapter 9 of my book I recommend David Goodhart’s ‘The Road to Somewhere to answer what you say in your final paragraph. Location and community mean something to people in places like Sunderland. Traditional manufacturing and extractive industries led to people moving and putting down roots in places with families for generations. They would ask why should they move 200 miles? Why isn’t the government helping them? The Government allow in hundreds and thousands of immigrants a year, why isn’t there a migrant impact fund? There was nothing. People were just left to sink or swim, and those that were sinking were left to fester. In South Lincolnshire, with, as you say, zero unemployment, chapter 8 of our book details that wages fell, NHS and school spaces were limited, and because many of the immigrants were self employed, they were never registered and the government thus didn’t know where they were and where to provide services for them. I feel that it is all far more complicated than you think it is. I also think it is important to note that I would never let my students give an anecdotal example of someone they know and generalise from that! Yes, the European project offered a higher goal, but in my research for the book I found that higher goal has never been explained to the British people. This is why it was too late when it came to the six months of the Referendum campaign that Stronger In were together and why they lapsed to using project fear. There are racists in the Uk. But not enough to win a referendum. Just seeking some clarity on your final paragraph. For context I’m neither for nor against Brexit itself (not in a position to be either). You have said that that those on the ideological team of Chapman may claim that they have a license to lie, if those are the tactics the Leave campaign, in question, employed. Your rebuttal is on the basis that they are attempting a large feat, for which they need to retain their dignity. Firstly, it must be noted, your argument against their potential point grants the hypothetical assumption that they are correct in claiming the Leave campaign lied in the first place. I am interpreting this because you’ve already outlined, prior to this paragraph, why they have clearly not lied, in which case Chapman & Co’s potential claim need not be addressed at all. Secondly, your having given the rebuttal regarding the difficult task lying ahead, and dignity required for it, has entered you into a debate on this matter with the given assumption, in this hypothetical, that their claim is correct. So, following this, was the referendum itself not “very difficult”, in a similar manner, for the Leave campaign? If we accept that it was, then your argument would appear to collapse. If the Leave campaign employed the use of lies, which we’ve established in this scenario that we take as given that they have, and succeeded in a referendum win, then surely there is no clear reason why Chapman & co may not also have success with a similar approach. I’m not making an argument for lying, just questioning your logic behind the dismissal of the argument with the particular route you’ve taken. I understand a moral objection to the lie for lie tactic, but your argument goes beyond a personal philosophical viewpoint on that matter and into an argument against the logical legitimacy of it. Hi Sean. Nice to hear from you. I said that I didn’t think the 350m was a lie. But if it is a lie, then the Remainers using the argument that ‘they lied so we can’ is not good enough and they can and should do better.